The 20-0 Saints and 16-4 Yachtsmen will face off Saturday at the Colisee. LEWISTON — Devon Sarazin describes the Falmouth High girls’ hockey season as one of peaks and valleys. For the third time in six years, the Yachtsmen (16-4) are playing for the state championship. 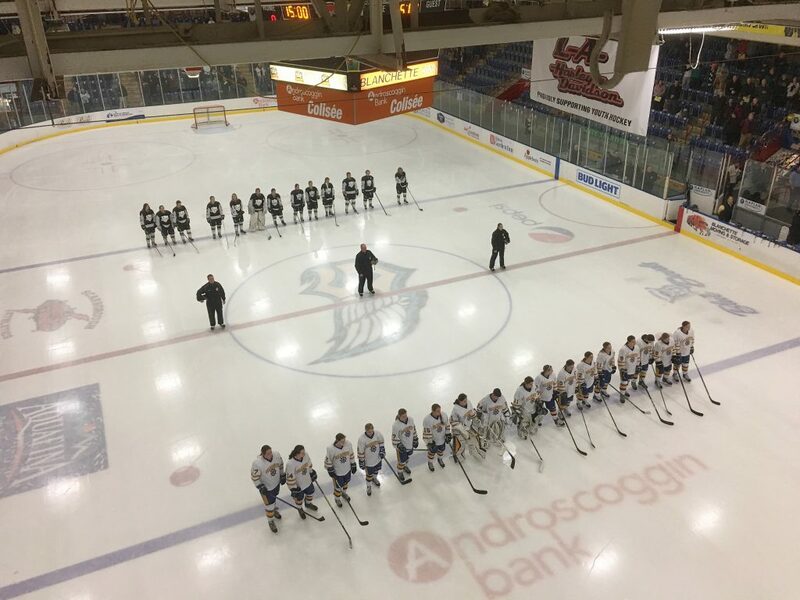 At 3 p.m. Saturday they will face their toughest challenge in St. Dominic (20-0), the defending state champion, at the Androscoggin Bank Colisee. Sarazin scored two goals Thursday in the South final against Scarborough. Falmouth’s 3-1 victory atoned for last year’s 5-2 loss to the Red Storm in the regional final. Scarborough edged Falmouth 3-2 in the regular season on Feb. 1. Falmouth boasts five seniors, including Caroline Proctor, who has helped anchor the defense. Opponents have averaged just 1.5 goals past goalie Allie Hurdman, also a senior. Falmouth has averaged 5.5 goals this season but lost to St. Dominic 6-0 in a regular-season game Jan. 16. The Saints are no strangers to that stage. They’ve won two state titles (2011 and 2016), and a third would give them more than any other team in a sport that has staged championships since 2009. Falmouth lost in both of its earlier trips to the state title game, in 2012 to Greely and 2015 to Lewiston. If St. Dom’s has any weaknesses, no team has figured out how to exploit them. The Saints are as strong on offense as they are on defense, averaging eight goals a game while allowing opponents less than one. Of their 20 wins, just two have been by one goal. Kristina Cornelio is one offensive threat the Yachtsmen will be hard-pressed to stop. The sophomore forward has totaled seven goals in the playoffs – five in the Saints’ 6-2 regional semifinal win over Brunswick and two in the North regional title game, a 4-0 win over Greely on Thursday. St. Dominic’s ability to control games doesn’t allow goalie Payton Winslow to see much action. That might change Saturday. In their 9-0 regional semifinal win, the Yachtsmen outshot York/Traip Academy, 43-6. But if that game is any indication of Winslow’s dependability, she managed to get the job done, rejecting 22 of the Rangers’ shots on goal. She went five consecutive games in the regular season without allowing a goal. For sophomore defender Isabelle Frenette – who notched a goal and an assist for the Saints on Thursday – her strategy for defending the state title is simple.